The Campaign is 5e, any books are fine, no UA. Recently, our first campaign has drawn to a close and soon another campaign will begin. As with our last campaign it will start at level one. Right now I'm thinking of using the point buy system again, but if people feel strongly about rolling I'm open to whatever people want, and they can roll on the map-tools server for their character. Building off things I learned in this past campaign there will be a couple of homebrew rules and variations to basic rules. One: the land of Avernum is a land of scarce resources, and though things are not as bad in the current campaign as they were in the first one there is a tier of weapon and armor usefulness. Stone weapons – they can be made from obsidian or flint, but also from heavier stone that does not hold an edge. They cost one half normal amount, and have a -2 penalty (hit and damage). Bronze weapons – Cost is book list basic, -1 penalty. Iron weapons – Cost is half again (so one hundred fifty percent). No bonus or penalty. Steel weapons – Cost is double, +1 bonus. Armor has the same cost and bonus/penalty as weapons, but no stone options. Leather and hide are unchanged. Two: Long range teleportation spells are not allowed. The field of teleportation is a new and exciting venture in the world of Ermarian. Things that are not direct teleportation or can be flavored, like misty step, are okay. Three: Because of the pacing of our last campaign, I want to try changing the rest cycle. Instead of one hour/eight hour short/long rests it will be one night/one week short/long rests. Standard travel should not impact the long rest cycle, combat will. I'll also rule that spending three days in town, or not moving on the world map can count as a full long rest. These are open to discussion, as always. In addition, as always, specific rulings to specific problems will be made when or if they come up. The Imperium of Pralgad rules the known surface. Under the reign of Hawthorne I, exploration of both teleportation magics and long range scrying was implemented to find more lands suitable for colonization or conquest. A series of underground caverns was discovered and an expedition was launched to ascertain the viability of a colony there. The IX Imperial Legion was sent down. After a few weeks, they were never heard from again. Hawthorne II had the perfect use for these caves. Rebels, malcontents, violent criminals, and political bothers were sent down there into exile. Only the worst and most violent were sent down, and fear of the unknown caves that wiped out a legion kept the people in line. When Hawthorne II passed away and Hawthorne III took the throne, he expanded and accelerated sending people into exile in the underground caverns. Petty criminals, social outcasts, tax evaders, and political rivals all found themselves exiled. The increased numbers made it easier to hide people wrongfully sent down by corrupt officials in minor political power struggles. These exiles founded cities, explored the caves, studied magic, and drove back hostile natives to carve out a kingdom for themselves. They named it Avernum, to remind themselves it was not their original home. Not everyone, however, was content to live peacefully in their new home. Some burned with anger at those that exiled them underground. The powerful enchantrix, Erika Redmark, devised a plan and found a group willing to carry it out. Using a complex magical ritual she sent a group of assassins to kill Hawthrone III. The Imperium responded in two ways. The first was immediate, no one else was exiled into the caverns. The people of Avernum hoped that this would be the extent of the Empire's plan. The king of Avernum, King Micah, did his best to rally his people and prepare them for any future incursion. He banished those responsible to the far caves and secured his kingdom's borders. Yet years passed and nothing happened, careful watch was dropped. Ten years after the death of Hawthorne III, the second response by the Empire happened. Seeing that a lack of new people into the caverns had not caused the fledgling kingdom to wither and die, they slowly built up forces in secret in the caves. Their assault was overwhelming, In a matter of days the fortress city of Bargha fell, followed almost instantly by the city of Spire, and only a brave and suicidal stand at Ft Spire bought refugees enough time to flee into the Great Cave. The only thing between the Imperial legion and the major population center of the Great Cave was Ft Saffron. At the same time, Imperial forces launched naval expiditions into Slithzerikai lands, extending their control far enough to threaten Ft Dranlon and the Eastern Gallery. Desperate and brave fighting by Avernumite troops and imperial overreach saw a stalemate reached. Both sides dug in, built fortifications, and probed the other side's weaknesses with raids and covert operations. Imperial forces waited for more troops to be sent down, a slow and expensive process; while Avernum called up its militias and began conscripting citizens to fill their ranks, fighting for its very existence. Your player has several options. Every race in the PHB is available, in addition Nephilim (Gnolls) and Slithzerikai (Lizardfolk) are allowed as player choices. Evil is not allowed as an alignment. Everyone other other then Sliths have the option of choosing between being surface born and exiled, or being a native to the caves who was born there. All Slith are native to the caves. It is up to the player whether their character volunteered for military service or was conscripted, but every character is currently a member of the Avernum Army. The party assembled at Formello, before marching to Ft. Ganrick, where the campaign will begin. If you require knowledge of places in the world, surface or underground, to write a background any request for information will be answered. I'll include a small atlas in the next post with basic knowledge. *Reasons for being sent to Avernum are varied, and under the current administration of the Empire people being sent there has increased then under the former rulers. If a band of rebels stayed at your inn, and you didn't know who they were, and they got busted; odds are they would be killed and the inn keep and workers would be punished by being sent to Avernum. If you don't fit into the social harmony as imagined by the local ruler, you could be sent to Avernum; say you worship a god that is chaotic, and refuse to follow certain conventions, like bowing to the local lord when they ride by on horse. If you're a family member who openly rebelled or fought the establishment in some way, you could be sent to Avernum as a punitive act against the fighter. If you, for a really good reason you need to tell me, asked to be sent there. ** I don't need years or dates or ages; I'm looking more for you to think about how your character got to where they are today. Their parents, what they did for a living, how it effected them growing up, did they have any interactions with the establishment, did they grumble being on the lower end of the social scale, as you grew older did you follow in their footsteps or go your own way, how did you make a living until you got jailed and sent to Avernum, what event got you jailed and sent to Avernum. *** I'm not talking about the weak flaws listed in the player handbook, I'm talking about a real fear, something they feel in their gut, even if they can overcome it. Heights, deep water, total darkness, creepy crawly things, enclosed spaces, death, public speaking... I don't expect this fear to stop them in their tracks, but when faced with it they might pause for a second and go 'why did it have to be snakes' before confronting the issue (they are, after all, a hero figure). If you can work it into their history so much more the better. (like, a group of bullies locked poor character into a trunk when he was younger for a day, and now small enclosed spaces make him anxious, I dunno). Session zero will be on March 31, 6pm EST. We meet on a TS3 server, so that is required. Maptools is also required, as it is what we use for the game itself; D&D 5e. Feel free to contact me on the forum, or on discord (discord.gkserver.us) if you don't have a forum account. The planet of this campaign is called “Ermarian”, or at least so called in all official Imperial channels. It is derived from old human tongues and is generally considered to mean “the glorious”; though that is from some conjecture by Imperial historians. The Empire claims to control the entire surface of the planet, and indeed does control the known world, some Imperial scholars claim that their may be lands as yet un-found, but which, of course, the Empire holds dominion over. Of the known lands, there are four continents. Aizo is the birthplace of the Empire, a continent of sprawling forests and old, soft mountain ranges. Despite this being the place of the Empire's founding it has been outpaced by other continents in terms of development. A temperate climate with humid summers and snowy winters inland, with more mild temperatures on the coast, humans have come to dominate this continent almost completely, but the population is concentrated around the coast, and a few miles inland. There is less population inland, but the land remains fairly tame. Aizo is one of the most xenophobic lands in the Empire. Logging and mining are the major industries. The old Imperial style of fashion comes back into vogue every now and again, and trade between Aizo and other parts of the Empire is great. Stonehurst is the capitol and largest port; located in the northeast. Pralgad is the 'new' seat of the Imperial government, and has been for centuries. In fact, the current Imperial calander is based on the founding of the Empire on Pralgad, IE (Imperial Era, the modern times) or BP (Before Pralgad). The west half of the continent is a mix of plains and forest, and produces much food for the Empire. The eastern half is more mountainous, with forests and large sections of swampland as well. The climate is temperate. Humans and non-humans are more mixed here, but the human establishment books no nonsense from those they suffer to live on the continent. The capitol of the continent and the Empire is Solaria, though the old capitol of Imperius still stands. The major industries in Pralgad are cash crops, and mining. Other notable cities include Easton, Blackstone and Sakagrad. Vantanas is both one of the richest and most dangerous lands in the Empire. Despite being a relatively small 'continent' (about one quarter the size of Azio or one third the size or Valorim) it is rich in natural resources. Spices, gems, minerals, and other exotic goods can be found in abundance in Vantanas. Geographically it is the continent furthest to the south in the Empire and the climate is mostly tropical, with swampy, mountainous, and desert like lands as one travels west from the firmly Imperial lands in the east; Several volcanoes (active and dormant) can be found in the northern regions. Ethnically it is one of the most diverse regions in the Empire, with humans just barely being a majority. It is estimated that as much as one third of the population is as yet 'uncivilized' and is waiting for Imperial humans to bring the light of civilization to them. The capitol is Woodsmuir, in the east of the continent. Valorim is the most recently settled region of the Empire, and already is considered safer then Vantanas. It is a temperate land, of mountain ranges forests, and some hilly plains. It tends to import finished goods from Pralgad, and export them raw resources. Humans have a firm majority of the population here, at about two thirds. But in Valorim are some of the few areas where non-humans can have almost equality. Humans tend to be much too busy settling the land to worry about any non-humans that are not trying to kill them, and even becoming friends with some who work and fight alongside them. The official Imperial position, however, still makes life harder on non-humans then humans. The capitol of the region is Tinraya Keep, in the far north of the continent. Though connected to Pralgad by an isthmus, the isthmus is so rocky and narrow that almost all trade is done between the continents by ship. The isthmus ranges from just above sea level, where stormy weather can drive the entire thing underwater, to hundreds of feet of very rocky terrain. Religion in the Empire tends to be a subdued affair. Most are encouraged to pay homage to the Emperor. About fifteen percent of Imperial citizens (humans) claim a religion, with the majority (five percent) being part of the Anama church; another big block (three percent) are part of the church of Divine Lucre. The rest who claim to be religious (about seven percent) worship a variety of gods and are not part of a block. Non-humans tend toward their own 'pagan' beliefs. The Anama believe that the use of magic is a harmful and corrupting affair, and shun it and encourage others to shun it. The Divine Lucre believes in accumulation of wealth and personal enjoyment. Other minor sects worship as their gods dictate. The caverns that would eventually make up the Kingdom of Avernum were first found in 761 IE, in the reign of Empire Hawthrone I. Though he did not put them to use as a prison in any sense, it was under his leadership that the disastrous expedition of the IX Legion occurred. The expensive disaster spelled the end of exploration under his reign. As teleportation magic research advanced when Hawthorne I passed on and Hawthorne II took the throne. The caves began to be used as punishment by the worst of offenders. Though this was an expensive proposition, the lack of cost for housing prisoners and the deterrent factor it presented made it an appealing program for the crown. For nearly three decades a steady stream of what the Empire considered its worst offenders were sent down into the caverns. When Hawthorne II passed away and Hawthorne III took the throne the number of crimes eligible for punishment of exile exploded, and masses of people were sent down. It was during this time that most major settlements were founded. The Eastern Gallery is the part most people first saw when sent into exile. A fort was built at the location people were teleported to, for their protection and to ease the considerable shock with a bit of civilization. The oldest settlements in the caverns are in this region, and it extends from Ft Draco and the Lair of Motrax in the north to the Tower of Magi in the south, with the Great Underground Sea forming its western boundary protected by Ft Dranlon. It's major industries include lumber harvest and shipbuilding in the central lands, and mining and smelting in the northern parts. The famed Tower of Magi is the center of magical learning in Avernum. Notable cities include Silvar and Corta, both found on the coast of the Great Underground Sea, and the farming community of Mertis. The Great Cave is considered the heart of Avernum. It is the most populated and civilized area in the caverns. It is here the capitol can be found, known simply as The Castle, where King Micah rules from. It is strategically protected with only a few means of entrance, all protected by fortifications. Fts Emerald, Saffron, Remote, and Almaria protect the people in the Great Cave. Its industries include food production in the east, mining in the west, and production of finished goods in the north. The south is generally bare and unpopulated. Almaria, considered by most to be the finest city in Avernum, is found in the great cave, as well as Dharmon and its rich iron mines, and Blosk with it's skilled crafts people, and finally Gnass, the city of friendly Slithzerikai. The great library, Patrick's Tower, is along the southern wall of the Great Cave. The Abyss is technically also a part of the Kingdom of Avernum, though any resident of place will vehemently deny it. It was used as a place to exile the truly violent criminals who could not start a new peaceful life in Avernum. After the Empire stopped sending people to Avernum, Avernum generally found itself with fewer violent criminals, and sent almost no new people to the Abyss as a result. In addition to violent exiles, many who are self styled social outcasts of lovers of freedom ended up in the Abyss, with criminals and their ilk forming the city of Spire, and those wishing to rule themselves outside of Avernum forming the city of Bargha. Ft Spire, controlled by the crown of Avernum, controls the main way into this series of caves and so leaving without permission is hard. 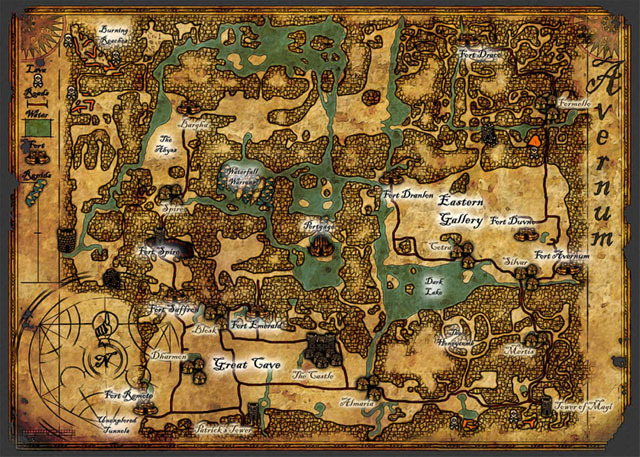 In addition, the tower of Erika Redmark can be found in this region of caverns. There is no major industry in these lands, as exportation is difficult and undesired. It has, however, made the people very self-reliant in everything from food production to weapons manufacture. The Slith Lands are a series of seas and islands north of the Great cave and west of the Eastern Gallery. It is from these lands that the Slithzerikai launched their first war against the Kingdom of Avernum. Which after some time ended in victory for Avernum. It is still populated almost entirely by Sliths due to the terrain. Fishing and metalworking are its main industries. There are no major cities of note, but trade between the tribes of Slith and the people of Avernum is on the rise. All other lands are sparsely populated and generally referred to as either Untamed Lands or Distant Caverns. They can be quite hostile to inhabit, and only adventurous types generally visit them. Avernum is ruled by three branches of Power. King Micah is in charge of military affairs, and do to the constant threats that face the kingdom has a great deal of power. A Triad of Magi control the affairs of magic use and education in the kingdom, and a council of mayors of the biggest cities in Avernum make up the third branch, usually dealing with more mundane day to day tasks. Religion in Avernum is more open then on the surface, though some still trust in the Emperor's Cult many have looked elsewhere for spiritual guidance. Nearly half the people in Avernum are of some religion, The Church of Prevailing Righteousness is a warrior religion its primary tenet is “Peace though smiting those who would disturb peace,” The Church of the Bright Star is more directed toward the healing arts and optimism, and the Path of the True way is a sect focused on fighting demonic activity and exploration of planes beyond the material, both the Anama Church and the Church of the Divine Lucre also have a presence in Avernum, and many smaller groups also exist. As I've stated on Friday, I've sent a PM about stuff. Also, I've rolled up my new character already (Using rolls.) I'm not OP, if you like I can present you my Stats, if you do not like how they came out I can reroll them during the session. Apologies but is this like classic DnD? Mind if I listen in on the session? Maybe eventually join in? Quote: Apologies but is this like classic DnD? Mind if I listen in on the session? Maybe eventually join in? I don't know what differences there are between ADD and 5e D&D, to be honest. All the general rules can be found in the 5e PHB (player handbook), a quick google search can get you a pdf of it. You can listen in if you want and it is open for people to join for a while. ---Sunday, April 7th, 6pm EST. People are welcome to check it out without playing or to join in, but without maptools (link in OP) there is nothing to watch or do. What your Character has been sent to Avernum for/or If they were born there*: Sent to Avernum as a result of lesser thievery. - From Solaria in Eastern Pralgrad of the Empire. - Exiled from Solaria for lesser thievery of tomes, Varin was sent to Avernum as punishment. - Former researcher for arcane practitioners. Always claimed that what magicks he knows came from picking up bits of information in his research for others. Something your character fears***: Deep waters and The Anama and public demonization of magicks. The party traveled from Ft Ganrick to Ft Draco, and was tasked with tracking down a smuggling operation. After searching the town and asking questions they located the smugglers and took them out. exp earned is 115; bringing total to 330. Everyone should now be level 2.
loot found is 80 gold and 32 gold. already divided; 2 gold remaining. a total of 28 days rations. 3 leather armor sets, 3 'slightly used' leather armor sets. 1 'slightly used' studded leather armor, 7 bronze scimitars, 4 shields, a bronze dagger, a bronze mace, a bronze spear, bronze chain mail, some travelers clothes.